Wildflower at sunrise at Tejon Ranch, south of Bakersfield, in this file photo. After lions craving taquitos, a Mountain Dew-thieving cheetah and an environmentally conscious Melissa McCarthy, it was probably just a matter of time before the Budweiser Clydesdales put in an appearance at Tejon Ranch. Anheuser-Busch is just the latest company to choose the sprawling 270,000-acre ranch as a location for a Super Bowl commercial. 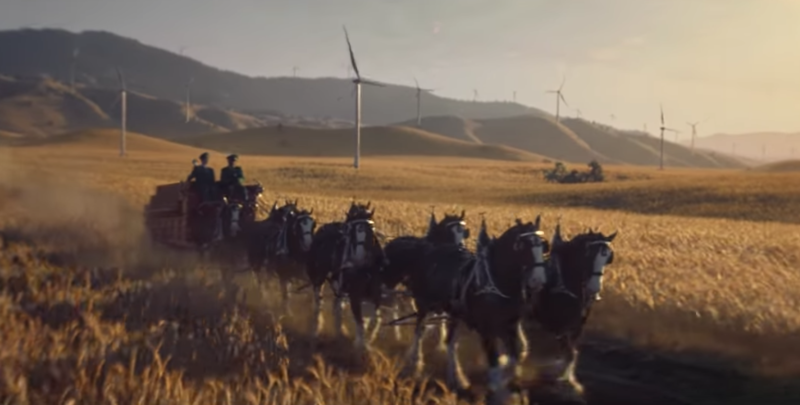 Its ad, which aired Sunday during Super Bowl LIII, shows a team of Clydesdales pulling a Budweiser wagon through barley fields, a Dalmatian atop the wagon, its ears and mouth flapping in the breeze. As Bob Dylan's "Blowin' in the Wind" plays, the camera pulls back to reveal massive wind turbines slowly turning among the fields and nearby hills. The turbines are computer-generated and not part of the actual landscape, but the hills and countryside are located in what's called the "Old Headquarters" area of the ranch southeast of Arvin and between 10 to 15 miles east of Interstate 5. The ad was shot over a two-day period in November, said Barry Zoeller, the ranch's vice president of corporate communications and investor relations. "They were looking for the type of fields and mountains we have here," Zoeller said of Smuggler Inc., the Los Angeles production company that filmed the spot. A number of other Super Bowl commercials have been filmed at the ranch. In 1997, Taco Bell shot its "Lions" ad there, where two of the large cats covet some campers' taquitos. In 2000, a Mountain Dew ad had a bicyclist chase down a cheetah who stole his can of the soda, for "Bad Cheetah." Coke shot an ad for the 2010 Super Bowl called "Sleepwalking," where a man walks in his sleep through an African plain and several animals to get his drink. And in 2017, McCarthy portrayed an eco warrior sent to a number of places to help environmental causes, reaching each in her sturdy Kia. Tejon Ranch stood in for Africa. Hollywood often comes calling, too. Some big budget productions in which the ranch has been featured in recent years include installments of the "Fast & Furious" and "Star Trek" franchises. One of the more memorable scenes in the 2000s to be shot there is the opening of "Seabiscuit," Zoeller said, with its shots of horses galloping across the countryside. Between Super Bowl ads and major film productions, the ranch is also the site for numerous car commercials. Zoeller said the ranch has a variety of roads, and since it's private property it's easy to film without shutting down major roadways and hampering traffic. He said it makes ranch officials proud when the location pops up on TV. "It's a good way to share Tejon Ranch with the world," he said. Phony wind generators . . . ? How 'bout a 'romantic' paved road & Budweiser Truck in a 'CG' city . . . like Tejon's Centennial . . . Outlets . . . or TMV . . . instead of the cattle and 'antelope' that used to roam here "Out West". Sorta mixed feelings and images here & now . . .like all "Next Gens" fantasize in abstract . . . about . . . our . . . "Golden State" . . . ! And BTW, Barry, you may remember our discussions. I've toured that same Budweiser plant . . . as well as ridden those grassy Tejon hills on old Flint . . . and stroked that "Eight-Up" hands-on, 'up close and personal' . . .!